Chair cushions There are 17 products. 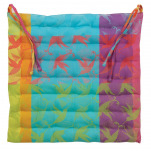 Fancy chair cushion green, blue, red, orange, purple and yellow birds, thickness 3 cm. 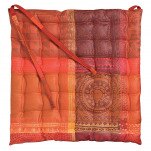 Chair cushion with 1 side 100% cotton and 1 side cotton coated, spongeable. 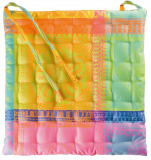 Chair cushion practical because you can arrange them according to the use (inside, outside, adult, child). Attached by 100% cotton ties. Price for 2 pieces. 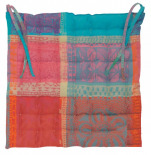 Fancy chair cushion pink, turquoise, mauve, coral, thickness 3 cm. 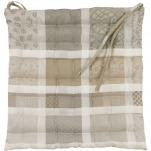 Chair cushion with 1 side 100% cotton and 1 side cotton coated, spongeable. Chair cushion practical because you can arrange them according to the use (inside, outside, adult, child). Attached by 100% cotton ties. Price for 2 pieces. 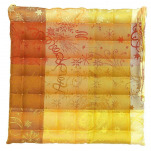 Fancy chair cushion pink, yellow, orange and green thickness 3 cm. Chair cushion with 1 side 100% cotton and 1 side cotton coated, spongeable. Chair cushion practical because you can arrange them according to the use (inside, outside, adult, child). Attached by 100% cotton ties. Price for 2 pieces. 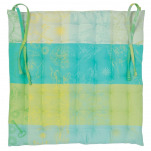 Fancy chair cushion green and blue thickness 3 cm. Chair cushion with 1 side 100% cotton and 1 side cotton coated, spongeable. 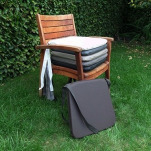 Chair cushion practical because you can arrange them according to the use (inside, outside, adult, child). Attached by 100% cotton ties. Price for 2 pieces.